We were contacted by the company contracted to fit blinds to the main hall at Weston College. There was excessive glare coming in through the glazed roof panels, making it hard to view the interactive white board in the hall. In addition to the glare, the hall’s temperature was becoming unbearable due to amount of solar heat coming through the glass. Given the nature of the glazing and the different uses for the hall, blinds would have been impractical and may have been broken from balls being kicked etc. After conducting a site survey and testing the glass, we established that the film had to be fitted externally due to the nature of the glazing. The client agreed on a dark dual reflective film, which would cut out 90% of heat and 92% of glare. The installation took two days and the client was delighted with the results. The College is now considering having the rest of the roof panels treated. 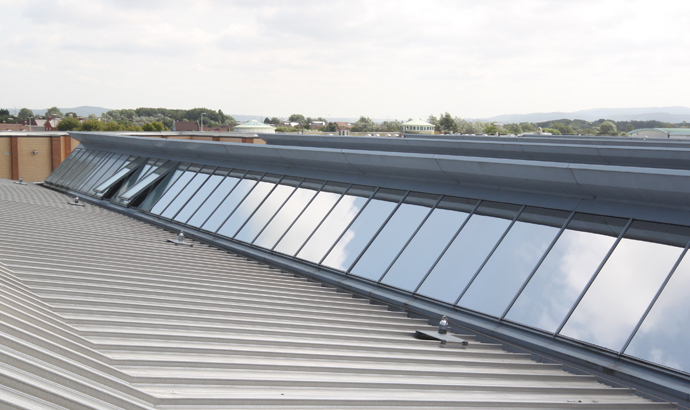 Wondering how Filmcote could help you with a window solution for your building? Call us today.